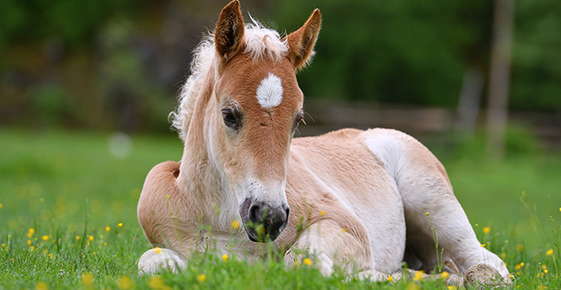 Many young foals have crooked hind or front legs. Lax ligaments and weak muscles usually cause this discrepancy between legs, which is often self-correcting as the horse grows. However, this deviation makes the young horses more likely to crush the cuboidal bones during exercise. If this happens, once the horse is grown and these bones are fully formed, the angular limb deformity (ALD) becomes permanent. Generally, ALD is classified as either valgus or varus. Valgus means the limbs deviate outward while varus describes an inward deviation. Carpus valgus, outward knee deviation, is the most common type found in young foals. It typically occurs in one or both of the foal’s front limbs. Many different factors can cause ALD. Perinatal factors include being one of twins, premature birth, placentitis, extreme parasite infestation, colic, trauma to perinatal soft tissue and soft tissue flaccidity around the joints. Developmental factors include too much exercise, unbalanced nutrition and trauma. Too much zinc or not enough copper in a foal’s diet may also lead to flexural deformities, that is, soft-tissue structural problems causing bones to align in different degrees of flexion. External traumas can cause fractures that prevent a foal’s bones from forming properly. To get more accurate information about a horse’s ALD, a veterinarian may recommend diagnostic tests. These include a hands-on exam to manipulate the foal’s limbs or the use of radiography. A radiograph assesses the deviation’s location, degree of angular deviation and the condition of the affected joint’s bones. The majority of colts affected by ALD spontaneously correct over time. However, veterinarians must use their professional training to guess which foals will naturally age out and which need more aggressive treatment while still growing. If the veterinarian determines that the long bones are incompletely ossified, she or he will prescribe stall rest. Splints and casts ensure proper alignment of limbs while waiting for cartilage to ossify enough to bear weight safely. However, splints and casts must be used judiciously. They should leave the foot free so the flexor tendons develop normally. Casts and splints should be changed every three to four days. In some cases, farriers can help foals with ALD by correctively trimming their feet. Depending on whether they trim the inside or outside of the foot, they can help correct valgus or varus deviations. Foals who do not respond to these relatively conservative measures of foot trimming, splints, casts or stall rests may need surgery. Veterinary surgeons use different techniques depending on the type of ALD. A veterinarian might recommend surgical methods to either accelerate or retard bone growth. He or she might surgically insert screws and plates or remove a wedge of bone. ALD is very common. However, different types and degrees of deviation call for different approaches. If you suspect your foal has ALD, call our office so we can come up with the best treatment plan possible.